An FFA chapter is netting fresh insights from a giant, endangered species. Large tanks bubble as koi do slow, meandering laps. Aquariums gurgle while lobsters peer through the glass. Vats of seaweed prepare to be processed. 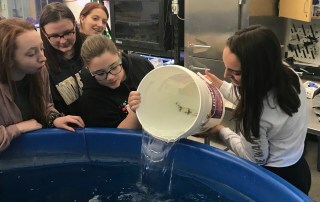 A Connecticut school dives deep into aquaculture to help students discover personal growth and career success.